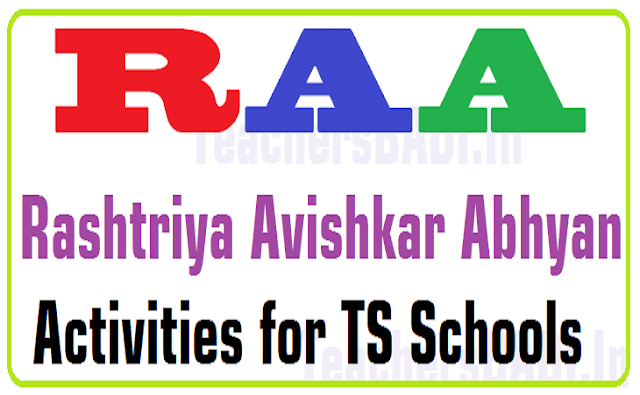 RAA in Telangana State/Rashtriya AvishkarAbhyan (RAA) in Telangana, Rashtriya AvishkarAbhyan (RAA) Activities for TS Schools 2016-17: MHRD has launched Rashtriya Avishkar Abhiyan (RAA) a 5 year project in 2015-16 in primary to higher secondary schools in pursuance of the focus on connecting school based knowledge to life outside the school making learning of science, mathematics a joyful meaningful activity and to bring focus on innovation and use of technology. 3. Instructions were given to DPOs to identify 10 good schools (criteria was given to select schools) in each district for implement of RAA. 4. Letters were sent in October, 2015 to the three mentoring Institutions identified by MHRD i.e University of Hyderabad; IIT, Hyderabad; NIT, Warangal to nominate the nodal officers representing their institutions. 5. Representative of Nodal officer from SSA attended the orientation programme on the implementation of RAA along with 3 nodal officers from 3 mentoring institutions in the month of November. 6. All 10 districts of Telangana selected 10 schools each and some districts selected mentoring institutes of their area and attached the schools to those mentoring institutes. 7. Selected schools' HMs and science teachers had a co-ordinated meeting with mentoring institutes' staff (in some districts). 8. Guidelines were sent to renovate and buy equipment to enrich science and maths labs with sanctioned funds allotted to use for RAA, but the funds have not been released to districts because budget has not been released. 9. We could not even release the funds to the districts where mentoring institutes (MHRD selected) are located so they are also unable to implement their plans due to same problem. 10. NIT, Warangal and IIT, Hyderabad have formed internal committees with faculty members to implement RAA. 11. NIT, Warangal with their own initiative held one day meeting with 10 school heads and science maths teachers and gave orientation to them about RAA. Their students are interacting with the selected schools’ students and teachers which is a positive thing. 12. IIT, Hyderabad is also doing their work on their own initiative but waiting for the funds to develop science and maths labs in the selected 2 schools. IIT, Hyderabad students and faculty are interacting and giving onsite help to the teachers of selected schools. 13. Students were taken to exposure visits to higher educational institutes. 1. Could not form SLSC (State Level steering Committee) because of various reasons. 2. Could not release the funds meant for RAA because of non release of budget amount from MHRD in time. a. Formation of SLSC as soon as possible. b. 5% of PS and UP schools will be selected as per MHRD guidelines. c. Teachers’ support systems: Capacity building of selected schools’ science and maths teachers will be planned and implemented. d. Science and maths subject forums will be strengthened in all districts. e. District Resource Groups will be strengthened. f. State Resource Group will be formed with science and maths teachers to concentrate on the implementation of RAA. g. Strengthening school science facilities: lab facilities will be strengthened as per RAA objectives. h. Effective class room transaction: Pedagogy and effective communication and hands on training will be planned by mentoring institutions. i. Nurturing student clubs and competitions: Junior science clubs, science fairs, math clubs, nature clubs will be formed and maintained. j. Community sensitization and engagement: Scientific temper and cleanliness and environmental awareness will be propagated in the community around the schools. k. Exposure visits will be planned for students to have exposure to technical institutes’ workshops, labs and other facilities. l. Science melas, maths melas, exhibitions will be conducted on the accessions of science day and maths day.